to flooding and severe weather, fire, and earthquakes all pose potential risk to buildings and collections. ​Below is a list of organizations that provide valuable assistance and on-line resources for disaster planning and response. AIC's Caring For Your Treasures organizes its conservation brochures by object type and provides disaster assistance and disaster planning tips for a wide range of objects and materials. http://www.conservation-us.org. The public can also call AIC-CERT at 202.661.8068. The American Institute for Conservation (AIC), the national association of conservation professionals, offers emergency response assistance to cultural organizations. Please help make sure that staff members of collecting institutions know to contact AIC-CERT when a disaster-flooding, hurricane, earthquake, fire-has damaged collections. * Call AIC's 24-hour assistance number at 202.661.8068 for advice by phone. * Call 202.661.8068 to arrange for a team to come to the site to complete damage assessments and help with salvage organization. CCAHA's website includes a downloadable pdf version of the "Mid-Atlantic Resource Guide for Disaster Preparedness," a valuable resource for any house museum or historic site. The site also includes on-line Technical Bulletins devoted to disaster recovery. CCAHA also maintains a list of over 100 vendors and associations for whom to call to assist with your recovery needs. Knowing who to call saves time and allows staff to respond as quickly as possible in an emergency. Click here to see the list. CoOL offers an extensive list of resources on preparedness and recovery strategies from organizations across the country, disaster plans, case studies, documents, tips and bibliographical references. Implementing the Framework for Emergency Response to get started creating an emergency plan for your institution. dPlan is an on-line template prepared by the Northeast Document Conservation Center and the Massachusetts Board of Library Commissioners to help organizations create an effective disaster prevention and response plan. The Heritage Emergency National Task Force website includes tips, instructions and links for disaster planning and response resources. The Image Permanence Institute's A Consumer Guide for the Recovery of Water-Damaged Traditional and Digital Prints is an excellent resource for anyone needing assistance in print preservation. The Library of Congress provides preservation procedures for collections exposed to water-damage. The LYRASIS website includes an emergency response checklist, disaster recovery resources and disaster planning and prevention information. The Minnesota Historical Society website includes links to pdf documents regarding emergency salvage procedures for a variety of object types and materials. The website also includes a disaster salvage tip sheet, a re-entry check list, an emergency call list form, an initial situation report, and an emergency preparedness plan. The State Library and State Archives are responsible for gathering information about the extent of storm damage in New York State to your building and/or collections as well as recovery costs. Contact Barbara Lilley (blilley@mail.nysed,gov) or Maria Holden (mholden@mail.nysed.gov) to report the impact of a storm on your organization. Archives at (518) 474-6926 or (518) 473-4254. 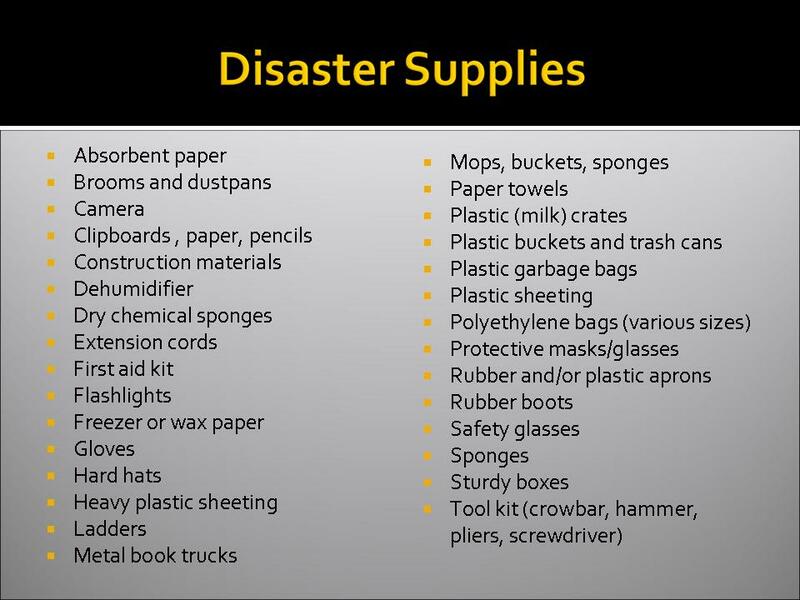 NEDCC offers disaster assistance, resources and tools for institutions with damaged paper-based collections. NPS's website provides guidance for planning and salvaging damaged paper objects. The National Park Service's Conserve-O-Grams are downloadable leaflets that touch upon various aspects of collection care. The National Trust provides an on-line forum for issues regarding post-Katrina hurricane recovery in the Gulf Coast. The website includes resources for homeowners, current events and news, recovery success stories, anda blog devoted to New Orleans. The National Trust also publishes books regarding disaster preparedness, which can be purchased through their website. Topics include earthquake-hazard reduction, fire safety, and flood damage.